They want to play on the fear of inconvenience in the healthy that even if you don’t die from the flu, you’re still out of commission for about a week. The real tear jerker is that they bring children into the equation. They report that 172 children and teens died of the flu in the 2017/2018 flu season. As a father of 3 boys, I can’t imagine me living longer than my child, at any age. I’ve seen what losing a child (even adult age) did to my own parents when my brother passed at age 37. But if we want to play the vulnerability fear game, what we should really fear is putting our kids in the car each day. This causes on average 11 deaths per week and averages out to be about 572 deaths each year. There’s a 232% greater chance of death putting your kid in the car to take them to the pediatrician (or virtually any grocery store with a pharmacy) to get the flu shot than dying from the flu itself. Or we can look at it another way. There’s about 4 million babies born every year. 4 million x 18 (birth to 18 years old) would mean there are roughly 72,000,000 Americans in that age group. If 172 die out of that 72 million, the risk factor for your child dying by NOT getting the flu shot is 0.00024%. But even that estimate is high because it’s not only the unvaccinated that does from the flu. Again, I don’t want to downplay the loss of a child but every decision we make regarding our children has a risk factor associated with it. I’m always going to weigh the known risk of NOT giving my kid a flu shot with the unknown risk of getting one. They prey on the young and old because they have compromised immune systems. This is the very reason a flu shot wouldn’t work in them in the first place. They can’t respond to the proposed mechanism of introducing a pathogen into the system and have an appropriate antibody response with that intervention. As a result, they use the ethical argument ‘for the greater good’ that by you getting a flu shot, you therefore don’t pass the flu onto those that are unfortunately going to benefit from the flu shot. The sad reality is that it doesn’t work. We already know the flu shot hasn’t been proven effective in those with lower immunity. There was an INCREASE in flu-related deaths from 1980 to 2001, when vaccine coverage went from 15-20% coverage to over 65% coverage. Yet, the flu shot is recommended every year. And there’s no benefit in the spread from the healthy. There are over 200 viruses that cause the flu and flu-like illness that produce the exact same ‘Influenza-Like Illness (ILI)’ symptoms (fever, headache, aches, pains, cough and runny noses). Without laboratory tests, doctors cannot tell two illnesses apart. The same initial symptoms for flu are the same initial symptoms for viral infections like polio. Both last for days and rarely lead to death or serious illness. At best, vaccines might be effective against only influenza A and B, which represent about 10% of all circulating viruses. The Cochran Library took 90 reports of 116 studies in 2013 and compared the effect of influenza vaccine with placebo or no intervention. Sixty-nine reports were clinical trials (over 70,000 people), 27 were comparative cohort studies (about eight million people) and 20 were case-control studies (nearly 25,000 people). Of the 116 studies, 23 (three case-control and 20 cohort studies) were performed during pregnancy (about 1.6 million mother-child couples). The preventive effect of parenteral inactivated influenza vaccine on healthy adults is small: at least 40 people would need vaccination to avoid one ILI case and 71 people would need vaccination to prevent one case of influenza . Their conclusion is that vaccination shows no appreciable effect on working days lost or hospitalization. The same authors of this review from back in 2010 assessed all trials that compared vaccinated people with unvaccinated people. The combined results of these trials showed that under ideal conditions (vaccine completely matching circulating viral configuration) 33 healthy adults need to be vaccinated to avoid one set of influenza symptoms. In average conditions (partially matching vaccine) 100 people need to be vaccinated to avoid one set of influenza symptoms. Vaccine use did not affect the number of people hospitalized or working days lost but caused one case of Guillian-Barré syndrome (a major neurological condition leading to paralysis) for every one million vaccinations. Fifteen of the 36 trials were funded by vaccine companies and four had no funding declaration. Our results may be an optimistic estimate because company-sponsored influenza vaccines trials tend to produce results favorable to their products and some of the evidence comes from trials carried out in ideal viral circulation and matching conditions and because the harms evidence base is limited. Their Reason #2: Getting a flu shot is your civic duty. Being a responsible citizen is our civic duty. “Do it for the greater good.” When it comes to vaccines, your civic duty is to understand you’re on your own when it comes to adverse reactions and effects. See the commentary on point #1. Since they can’t argue with the data, they have to make it about morals and ethics in which this moral argument has nothing to stand on. If we’re going to be talking about civics, then let’s highlight that vaccine manufacturer’s have been exempt from all wrong doing by the US government. If you or your child is injured from a vaccine, there is no liability from the vaccine maker. They are shielded from you. If you get paralyzed by a flu shot or your child has a serious reaction to a vaccine required for school and becomes learning disabled, epileptic, autistic, asthmatic, diabetic or mentally regressed, you are on your own. I’m not going to roll up my sleeve for a recommended medical decision when all liability has been taken away from the one to benefit the most, the drug maker. All medical interventions have risks. In fact, the US healthcare system is the 3rd leading cause of death in the country. There’s a lot of good but you can’t mandate something and then remove all accountability for that mandate. Their Reason #3: You can still get the flu, but you won’t be as sick. Efficacy is the measure of how effective a vaccine is at protecting the overall population. A 20 percent efficacy means that in a population, 20 percent fewer vaccinated people will get the flu compared to the unvaccinated people. You know what can get you a 33% efficacy EVERY time? The placebo. You know what makes you sick? Your lifestyle. Is it a coincidence that flu season happens over sugar-laden, sunshine avoiding holiday season from Halloween to Thanksgiving to Christmas to New Year’s to Valentine’s day to Easter? The CDC clearly outlines this on their website. 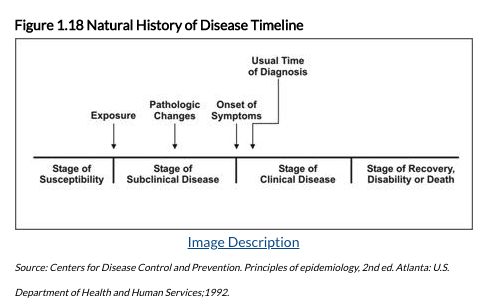 It’s called the Natural History of Disease Timeline. Here’s a screen shot of it below. You have to be weak before exposure takes place. And the fastest way to be weak during the holiday season is to partake without reservation and without discipline in the holiday season. Their Reason #4: Pregnant women who get the flu shot protect their babies from flu. This is just a bold faced lie. The flu shot is not tested on pregnant women. It might be tested on pregnant rats at super high doses but not on humans. If you look back in history, there was a pretty bad flu season in 1957-58 season. Due to major pressures on the surgeon general, he recommended flu vaccines for everyone with chronic debilitating disease, pregnant women, and those over aged 65 in 1960. Whenever there is a major problem in society, people look to the government to make a decision to help out the greater good. So the flu shot gets recommended to ‘high risk’ populations. The problem is that these recommendations were made without any data to support it. Due to it being repeated enough times, this recommendation itself is now being used as evidence for the need for flu shots today. That’s how we have always done it. Right? Their Reason #5: You cannot get flu from the flu vaccine. Tell me how those side effects are that much different than the flu? These are the same symptoms of the flu…but it’s not the flu. Does it matter? If you don’t want to get a flu shot, want to stay (or get) healthy, but have no idea where to start…start here. Thank you for this excellent rebuttal of the current marketing of the ‘flu jab. May I share it?